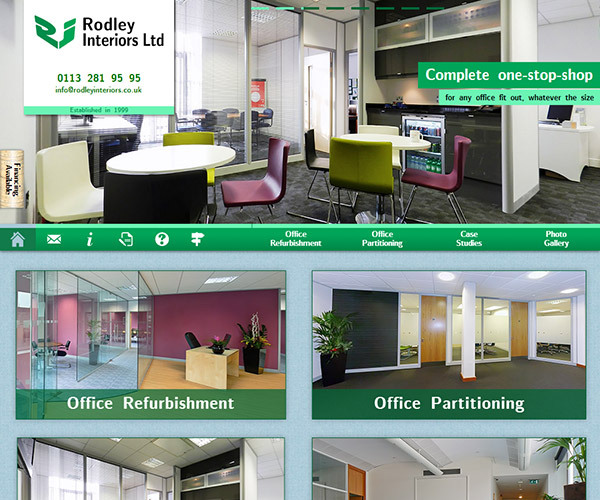 One of our oldest clients, Leeds based Rodley Interiors provide Office Refurbishment and Partitioning systems. They understand the benefits of an evolving and up-to-date website. They are now on the fourth version of their site. New pages are added regularly to further detail specific services or to show off another great office partitioning project. Just about all the photos throughout the site are of the clients own work and were taken by us. The 360° panoramas on the case studies are particularly impressive and were stitched together from many photos taken on-site.